It’s Maundy Thursday of Holy Week. Palm Sunday seems a long time ago. Children waved palm branches at church. It felt good to rejoice in the triumphal entry of the One who would surely be King and bring vindication and victory. But when the the palm branches turn brown and the “red-carpet” of cloaks is put away, unresolved conflicts remain. Evil presses in, not as easy to identify as we thought. Sin wins the day, both personally and corporately. Friends transform into enemies. Favorite doctrines and laws lose their luster. Disappointment, cynicism, and fear blind the eyes. If today we didn’t know what Holy Week would bring, we would be filled with longings and regrets, perhaps we’d even join the mob mentality of the Jews as Passover approached. Or perhaps we’d find ourselves cowering and cowardly as were the disciples. At these times, it’s hard to see the Light, feel the Hope, hold onto Courage. Some of us feel overcome by a sense of failure, helpless yearnings, and hopeless waiting. “How long, O Lord? … How long will you hide your face from me? How long must I wrestle with my thoughts and every day have sorrow in my heart? How long will my enemy triumph over me? Look on me and answer, O Lord my God. Give light to my eyes, or I will sleep in death…” (Psalm 13). Even today, David’s poetic psalms speak to our emotions. As the world lives, then what time is left. With only the promise of tomorrow. And where is the light? You knew it was true. Top quality on each shelf. I think never to be again. Truth and lies in a spin. sitting idle in all this rubble. no common sense, I’m left baffled. I took this photo of a sign erected at a viewpoint in Rocky Mountain National Park. I have visited the park during all seasons. In spring and summer the melodies of birds, squirrels, chipmunks, etc. rise and fall on the air. In late summer and early fall, elk calls bugle through the park. Then, on many winter days a soft, white, silent layer of snow breathlessly quiets the scene. Would you think of this “utter, complete silence” as a sound, as Andre Kostelantez did—even “one of the greatest sounds of them all”? Where/how do we find silence? What can we learn in silence? Do we tend to avoid—maybe even fear—silence? My curiosity piqued, I looked up Andre Kostelantez and learned that he was a Jewish/Russian immigrant to America who became one of the most successful conductors and arrangers of music in history. Among many accomplishments, he conducted the New York Philharmonic Orchestra. Music rests, seasons of silence, “important nothings”; these provide natural, satisfying rhythms to music and to our lives. This is a principle that God seems to have woven into creation. As physical, emotional, and spiritual beings, we need times of silence that can become “the greatest sound of all” to us. Nancy has learned to seek and relish these important-nothing rest times that give meaning and lilt to the music of her life. Have you found ways to incorporate regular seasons of silence into the flow of your days? For three years Jesus had ministered in word and deed. There was no one greater than he. Even the elements listened to him and obeyed; and even the dead responded and lived again. Those who witnessed Lazarus come forth from the dead could not doubt that “truly God” stood among them. When a person had been dead three days and rotting in cave, death was irreversible. But God can reverse what is irreversible. He gave Mary and Martha their brother back. Then Jesus traveled on to Jerusalem, the City of Peace where there was no peace, the City of the King that had no true king. But as Jesus and his disciples—accompanied by a large crowd—made their way to the city for Passover, something happened. An election was held on the streets and the ballot boxes were ripped from the date palm trees. With palm branches waving, the people ordained Jesus as the king. The red carpet was not out; but the long, full and stately palm branch would serve well in the excitement of the procession. This was a man who could feed the multitudes, calm the seas, and even raise the dead! Jesus told the pharisees who were there to question and criticize, that if these people did not proclaim him king, ‘If they keep quiet, the stones will cry out’ (Luke 19:40). On that day long ago, which we now celebrate as Palm Sunday, if the people had not proclaimed that Christ was King, God, Messiah, Savior—then the very inanimate rocks themselves would have proclaimed it. More ornamental palms are sold during the Easter season than any other time of the year. Do we buy them just because they are nice? Or is it an expression of our own “Hosanna”—a declaration of Jesus as our eternal and personal King? This post excerpted from the “Jesus and the Herbs” section of the book God’s Healing Herbs by Dennis Ellingson. —Written by one of my granddaughters (age 10 or 11 at the time) during an Easter Sunday church service as we celebrated Christ’s resurrection. I found this joyful verse written on the back of a bulletin I brought home in my purse. She gave me permission to share it but asked to remain anonymous. This child’s spontaneous expression of faith inspires me anew to praise the One who is risen indeed! Today, Valentine’s falls on Ash Wednesday—the beginning of Lent and, in many churches, the annual 40-day season of introspection and self-examination that leads to confession, repentance, and the spiritual freedom needed to receive the joy of Easter. At first, though, it seems ironic that a Valentine’s Day of flowers and candy coincides with a time typically thought of as giving up something—such as flowers and candy! But then, the colliding and coinciding can help us to see what they have in common with each other and this blog: love. Blessings on our Mother Earth. We are their love child. –Mary Harwell Sayler in PRAISE! Love of the beloved needs expression! The highest examples of these come in the Bible, the trek toward Easter, and the love expressed in poetry. You’ve undoubtedly read love poems—from greeting card verse on a Valentine to the 23rd Psalm to the poetic lines of a romantic sonnet. [You may have] tried your hand at writing a love poem too. But “love” has many faces. Take, for example, this prose poem. I’ll explain it once you’ve had a chance to experience it. Ever since childhood, I’ve “loved” poetry, which led to my reading the best works of classical and contemporary poets as evidenced in the above poem….. Once my tastes in poetry became more eclectic … I discovered poets from all over the world, each of whom brought experiences beyond my own. Attila Jozsef of Hungary was one such poet, with his thought-provoking, deliciously-worded, introspective poems (suitable for Lent) such as “The Dog.” But when I learned he’d committed suicide by throwing himself in front of a train, that sad news stunned me into writing a poem pleading for life and poetry and, perhaps, for his forgiveness of those of us who have led easier lives. Contemplation of our ease versus dis-ease, our lives versus death, our love versus bigotry, bias, boredom, and indifference gives us the stuff of which poetry and Lent are made. But the greatest of these is God’s Word of love. of your shoes, showing you where to go. News to paper the walls of your head. both broken and wasted ground. of our Spiritual Life and Eternal Hope. Are you feeling pressed down by the negativity of the world—bad news, worries, hurts, fears, anger? If you enjoy contemporary, spontaneous, free verse—or if you are willing to try poetry as a remedy for the affliction of a heavy spirit—Cladach has just released Mary Harwell Sayler‘s book, PRAISE! Poems. Let an explosion of praise break forth in your own life with adoration and celebration of our good God! While these short, contemporary poems acknowledge the realities around us, they also look for the good in everything. Sections within the book include: Praise • Prayers • Easter • Creation • Wonder • Christmas. As the storm passed and sun shone, the gleaming snow cover became for me a constant reminder of the body of Jesus—his very life—layed down, poured out, for us. As the ground, the trees, even the houses received the crystalline snow driven by the wind, so by faith we can receive Christ’s pure sacrifice, applied to our hearts by the grace of God. This complete, loving, redeeming sacrifice then covers our sins, bringing forgiveness, reconciliation, and the hope of eternal life. The effects of this “eternal snow” go even farther, however. 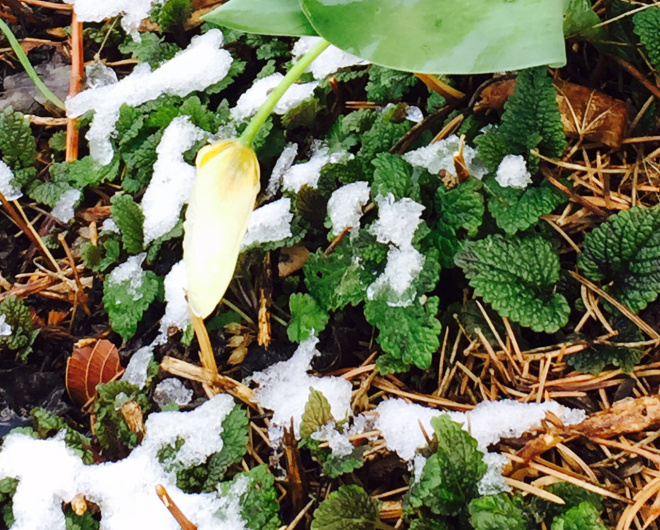 Today the snow on our yard, trees, and garden has melted and watered the greening grass and the perennials that are waking up for spring. Similarly, the gracious provision of Jesus not only covers us, but seeps into our beings, giving newness of life to our hearts and minds, nourishing our souls, imparting the very character of the One who poured out his life for us. Drops of blood or tear drops? We are told that creation itself moans because of the curse put upon us. Everything bears the mark of humankind’s sin. I don’t know how to understand it—but I believe plants, animals, and all of creation respond in some way to the God who made them. If a thorn bush could think, I wonder how it might have mourned to know that its branches were used to hurt the very One who had made it. If a bush could have shed tears rather than causing blood to be shed, and a bush could choose, I wonder whether the bush would have chosen tears.